The sleek, high-tech look of new condo lofts at 57 Bond Street, New York City, makes it quickly apparent that something extraordinary is happening in this Noho neighborhood. 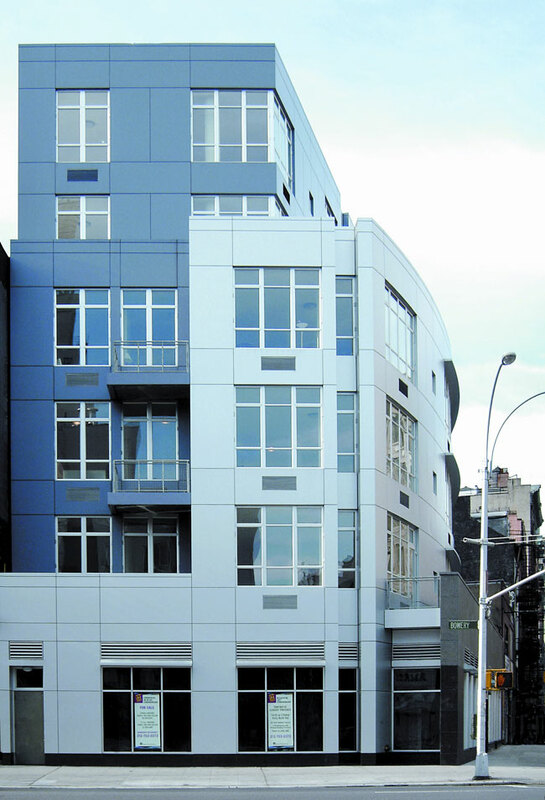 Newly constructed rather than renovated, the six-story building developed by an affiliate of Alchemy Properties Inc., an innovative New York City developer, brings modern architectural design to a distinctive downtown neighborhood. Above a floor of retail development, two oversize homes per floor with private outdoor space offer elegant design and state-of-the art amenities. For this project, the New York Council Society of American Registered Architects presented Meltzer/Mandl Architects PC the Award of Excellence. 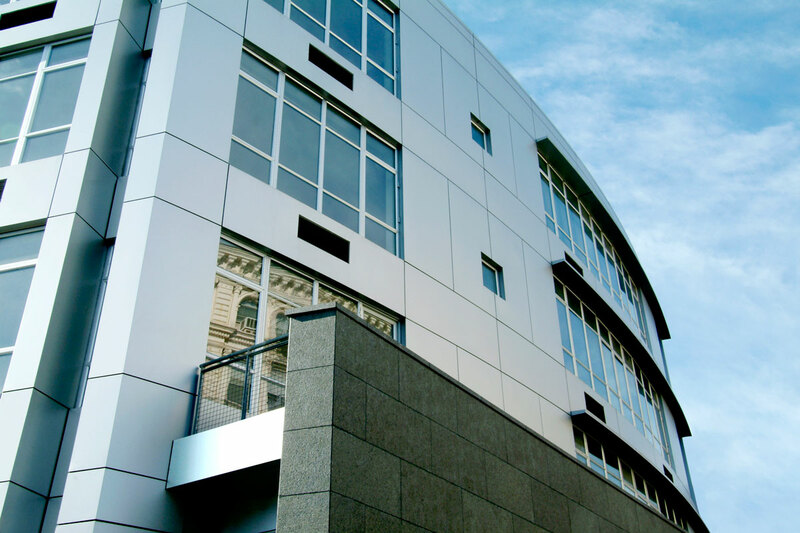 A first-floor facade of partial stone with columns helps the building relate to nearby architecture, while most of the exterior is clad in Alucobond Plus Material — an aluminum composite material (ACM) that consists of two sheets of aluminum bonded to a thermoplastic core. This rigid but relatively lightweight material of 4mm thickness often is chosen for its ability to maintain its smooth, visually flat appearance while being fabricated into crisp corners and sweeping curves – projecting a contemporary image. The 8-ft oversized loft-style windows of curved glass complement the curved metal of the exterior, suggesting the tremendous amount of light available to the interior rooms, with their soaring 11-ft. clear ceilings. The project features approximately 7200 sq. ft. of Alucobond Plus material in custom Violet Slate color and 7500 sq. ft. of Alucobond Plus Material in Sunrise Silver Metallic color. Material was attached using the dry gasketed rout and return system of Kenneth J. Herman, Inc.-which distributed, fabricated and installed the material. In addition to cladding, the material is used for a sunscreen fin and for round column covers at the storefront The theme of modern elegance is carried into the lobby with an Italian stone floor, high-tech lighting and Alucobond Material surfaces of Sunrise Silver. The building is “smart-wired” for high-speed internet access, telephones, fax and cable. It features a state-of-the-art video intercom security system and high-speed elevator. When completed in 2003, the loft residences were priced from $1,335,000. Sizes range from 1,470 sq. ft to 2,512 sq. ft, with private balconies and terraces up to 1,375 sq. ft. The residential amenities include high-end appliances and cabinets, Italian stone countertops, 4″ maple plank flooring, as well as master bathrooms with lavish fixtures, steam showers and stone floors. These luxurious features put 57 Bond Street and Alchemy Properties Inc. at the leading-edge of a trend in residential lofts—providing the ultimate in amenities. In the late 1800’s, the neighborhood surrounding this part of Bond St was known as “Five Points,” an area that has been described as “off-beat and sometimes radical,” or “a jagged district with a rebellious edge.” In contrast the developer says, “Today, this distinctive neighborhood has moved beyond its rag-tag past to become a cutting-edge enclave humming with a multinational creative mix of people, wonderful boutiques and great restaurants.” The developer adds, “Noho is the centerpiece of a new residential enclave within an easy distance to Gramercy Park, Midtown, Soho, Wall Street and Tribeca. Alchemy Properties Inc. was started in 1990. Additional information about 57 Bond Street can be found at www.noholofts.com. Your local Alucobond representative will be more than happy to discuss pricing and availability. Please use our “Find Your Local Alucobond Rep” page to locate an Alucobond representative nearest to you or feel free to contact Customer Service at 1-800-626-3365.